In this simple part of the journey, pilgrim face just one short yet difficult climb. Only those that work the vineyards can predict the journey to come. Thus, among olive trees, and despite the main road that disrupts some of the track, they will pass beautiful enclaves of Jacobean taste like Cirauqui where pilgrims will have no problem in finding supplies and can also relive the story of an old Roman road. Successive medieval bridges and dark legends tamed by the Codex Calixtino accompany the pilgrims on this pleasant walk. 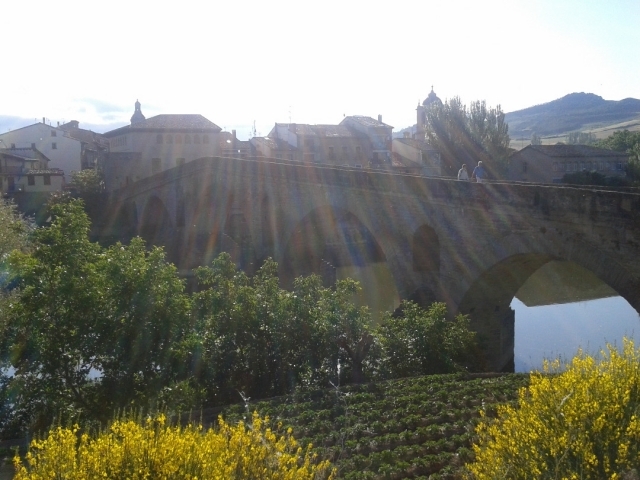 There is no better way to say goodbye to Puente la Reina (685 kilometres to Santiago), the starting point of this stage, than over the stunning medieval Puente la Reina bridge for which it is named the star queen bridge, one of the most photographed icons of the Camino de Santiago. The pilgrims cross the river Arga, and after turning left, join the road by a zebra crossing, saying goodbye to the beautiful town through Zubiurrutia the neighbourhood of nuns. The itinerary awaits a small resting area, and after approaching the river by a plain and uncomplicated path it leaves behind the purifying Puente la Reina. Then comes a tough climb, if possible, the most difficult stretch of the day, to reach the vicinity of the A-12, known to many expert hikers as the blush hill on the ancient route of the Way. But this time the asphalt is avoided thanks to a steep dirt track and from this height you can see Mañeru (17.9 kilometres to Estellla), the first stop on the stage. The pilgrims come to this traditional town and its famous wine taverns after passing a sixteenth century cross located at the entrance. The city tour continues along Calle de la Esperanza (Hope street) and the plaza de los Fueros to leave the enclave of medieval origin, where travellers will find both hotel services (private lodges and rural houses) and a doctors, along calle Forzosa (unavoidable street) named so because it heads towards the cemetery. From the cemetery, and along a track and at some intervals on a path, the journey awaits a beautiful stretch of almost three kilometres that runs between cereal fields, vineyards and olive trees, and for those wishing to see it Cirauqui, the next destination, nestled on a hill. However, before reaching the centre hikers can take a break and recharge their batteries in a recreational area. And the town of Cirauqui (15.4 kilometres to Estella), which in the Middle Ages and due to the flourishing of pilgrims built a hostel for pilgrims, it does not allow the walkers much chance to rest. A succession of steep streets make up this beautiful village, one of the most charming in Navarra on this Jacobean route, with all the amenities pilgrims may require, such as bars, bakeries, grocery stores, a pharmacy, cash machines and a doctors surgery. In the first climb, the pilgrims pass through the ancient gate of the walled city that gives access to its streets and squares. From them, and after climbing the stairs to the right which deviate from the Jacobean route, they reach the church of San Román, a beautiful Romanesque church of the twelfth century of Arab reminiscent, the entrance bears a relation to Santiago de Puente la Reina and that of San Pedro de la Rua de Estella, probably because it shares the same designer. In the surroundings of the temple there is also Maralotx a private lodge with a capacity for 28 people. After descending the stairs again, hikers must follow the yellow arrows that lead them through an arch into the Baroque town hall (here they can have the credential stamped) to continue, and now downhill, passing streets of different widths, to check out the place where two pleasant surprises await. The Camino de Santiago uses in some sections of this stage on an old Roman road where its original remains are still visible. In this way, and while treading on its history (in a good way), hikers will arrive, among rows of cypresses, to a bridge of the same time period, transformed in the eighteenth century. The legend of the Salado River (Salty River) The Motorway then passes through the pilgrim route so for safety reasons hikers should use the overpass. Then, make their way down a slope, on a solid path at first and later on a second path which in some places still retains the Roman pavement, arriving at the medieval bridge with a single (reconstructed) arc. After crossing the bridge, known as Camino Real, the trail continues along a path at first and then continues along an underpass that avoids the motorway again. It advances a few meters below on asphalt to return to a nice path that you take on the left and leads the walkers to Lorca (9.3 kilometres to Estella). This town of just 100 inhabitants, and where two privately owned shelters remain, has been closely linked to the pilgrimage route. In fact, as early as the thirteenth century it housed a hospital for pilgrims. The church of San Salvador (XII century), of late Romanesque architecture, is conserved, plus a Baroque figure of Santiago the pilgrim. The route crosses the enclave from one end to another along the calle Mayor and connects, to a local road, which overlooks Montejurra, a famous area during the Spanish transition. It was at this summit where two Carlist political groups (traditionalist and legitimist political movements that came to power in Spain in the nineteenth century. Seeking establishment on the throne of an alternative branch of the Bourbon dynasty) were killed in 1976 by far right gunmen. 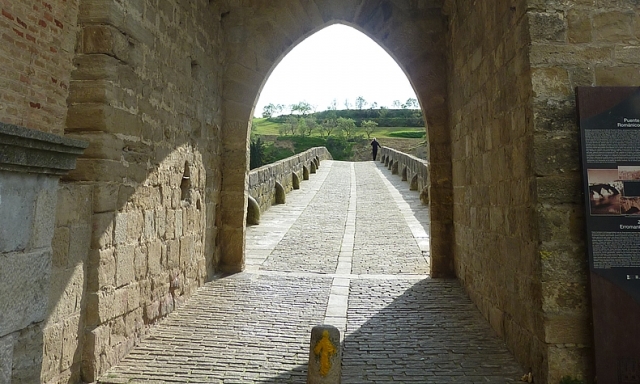 At times on tracks, paths and others routes, the road runs through an area dotted with crops and, after crossing the motorway again by an underpass, reaches Villatuerta, before Estella at (4.6 kilometres). This town, constantly growing due in part to its proximity to the motorway, receives the pilgrims with an urban itinerary that deserves honours. Beginning on the calle Camino de Santiago then continuing to plaza del peregrino, you reach the heart of San Ginés Street, which leads the pilgrims to a medieval Romanesque bridge that divides the town. After going over and reaching calle Nueva walkers come to the Gothic Church of the Assumption and the adjacent square, which houses the statue of San Veremundo, an abbot of Irache and patron saint of the Camino de Santiago in Navarre. Villatuerta claim this to be his birthplace. The tour leaves the enclave by Camino de Estella to continue on a flat path, which at times nears the chapel of San Miguel (X century), the only remains of a medieval monastery and one of the first Romanesque churches in the Western Pyrenees. In the temple, always open to hikers, many pilgrims leave written desires, thoughts, and endless requests that are stored for months. In Estella Now back on the official route (to reach the shrine you have to divert a few feet from of the Road) you come to a picnic area at the foot of the NA-132 road where in 2002 the Canadian pilgrim Mary Catherine Kimpton died. A stone monument with the slogan "May she always walk on fields of gold" recalls the tragic accident that forced the authorities to prevent people from crossing the road. At present, there is an underpass to avoid this. The stage enters its final stretch and heads towards Estella. The pilgrims only to complete one final path then cross the river Ega by a footbridge and follow its course to the historic town. Pilgrim cyclists will find no problem in completing this simple step by its original layout. Dismounting is only advised on sections of Roman road. Before reaching Cirauqui will some parts are difficult due to the clay path, which can become very muddy. In this enclave, and because of its steep slopes, there is another marked route also allowing them to avoid climbing to the top of the hill. After facing the first ascent, and while walkers will head for the only arch that is still preserved from the walls of this enclave, cyclists will turn left and go around the village. On the way down it links to the other route. 2 reviews Distance to Santiago: 663 km. 1 reviews Distance to Santiago: 681 km. 1 reviews Distance to Santiago: 672 km. 1 reviews Distance to Santiago: 668 km.